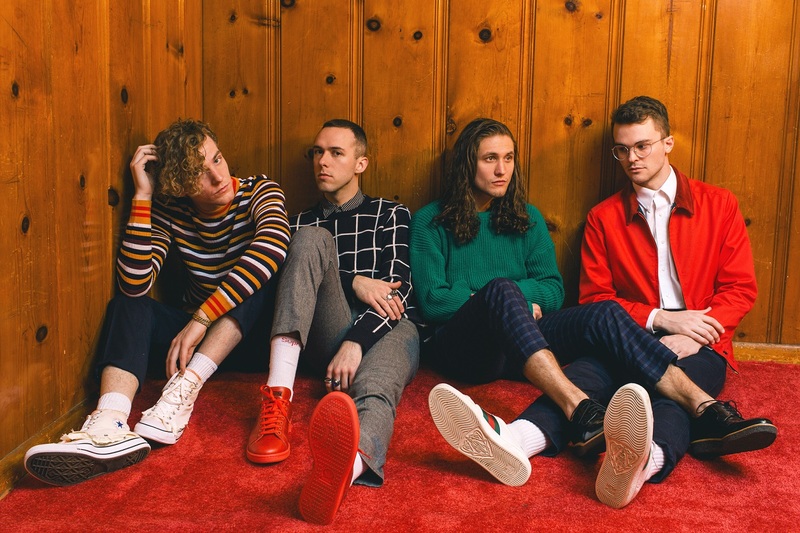 Atwood Magazine caught up with COIN to discuss the ins and outs of their new single “Growing Pains,” overthinking less, life on tour, and the band’s musical plans for 2018! Nashville’s COIN hit the ground “Run“ning in 2015, and they’re never looking back. A guitar-driven band with a penchant for uptempo anthems and big pop melodies, the four-piece of Chase Lawrence (lead vocals, synthesizers), Ryan Winnen (drums), Joe Memmel (lead guitar, backing vocals) and Zachary Dyke (bass guitar) have released two studio albums through Columbia Records over the past three years, cultivating a sizeable following of passionate, diehard fans through an endless supply of tour dates, on-point branding, personality and last but not least, a stream of infectiously catchy music. 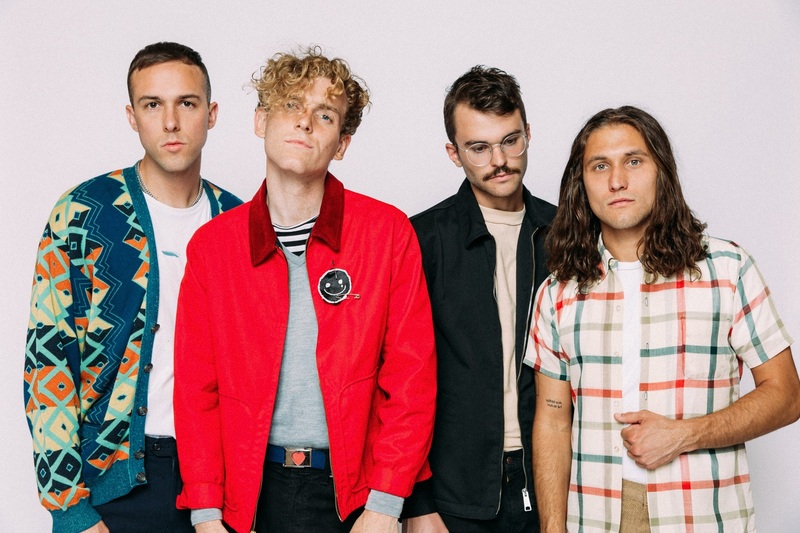 On paper, COIN have enjoyed a quick rise to success – but in reality and behind the scenes, COIN are one of the hardest-working bands of their generation. 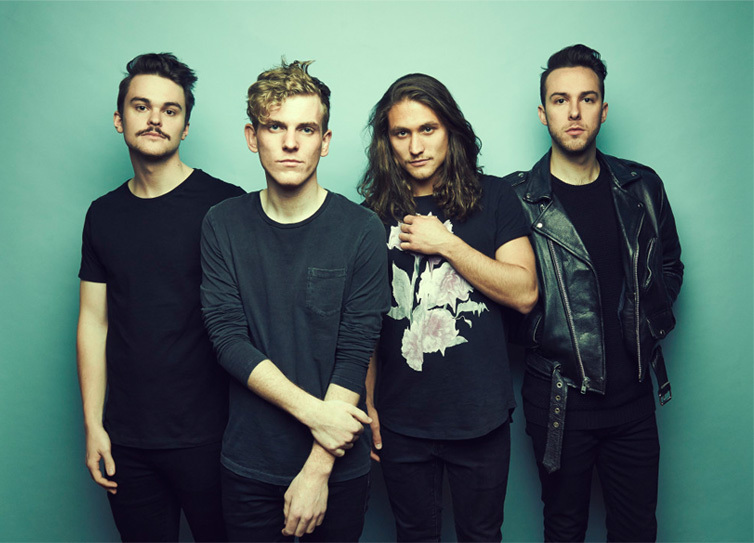 They have maximized every opportunity that’s come their way, from their label signing to earning prime tour slots with major acts like The 1975 and Young The Giant. COIN played over 70 concerts in 2015 alone and another 70 in 2017, working on new music at home while honing their skills on the road. COIN are tight and in-sync live, always finding ways of elevating their music and engaging the audience. Their tireless efforts resulted in this year’s sold-out headline U.S. tour, which began in New York in early February and ends mid-March. That less-is-more mentality resulted in the band’s fiery second album, and it continues to be their mantra today – if anything, it’s been amped up a notch. 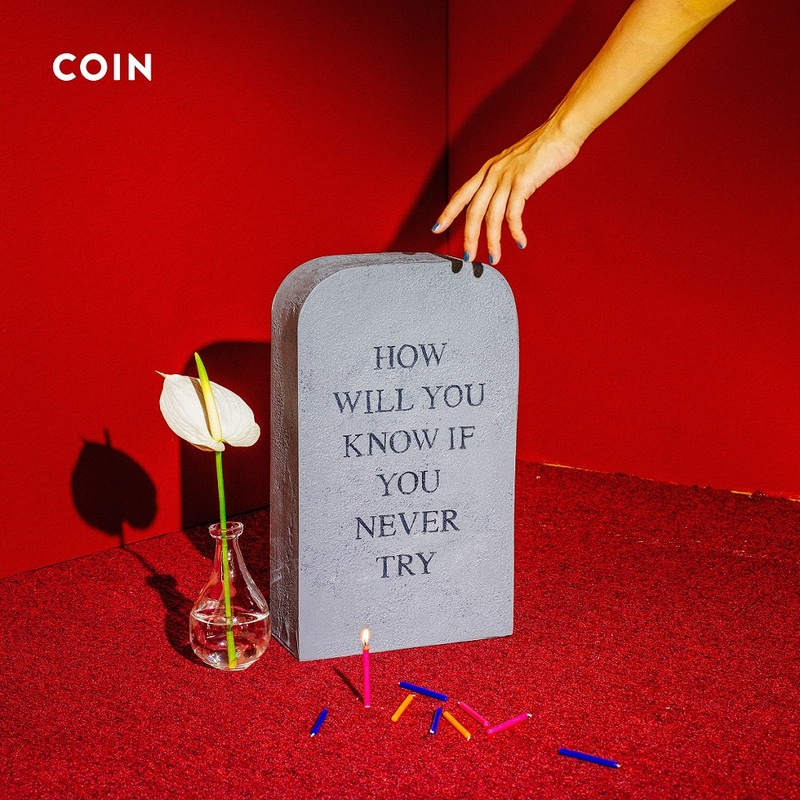 Released 2/9/2018, the explosive “Growing Pains” is the latest addition to COIN’s repertoire, and their first release since last year’s sophomore album, How Will You Know If You Never Try. Recorded for the most part in the van they drove on tour, the song boasts a gutsy raw energy and captures a wide range of dynamics – from softer moments of reflection, to bombastic shouts. While still carrying the band’s signature polished sound, “Growing Pains” contrasts with some of their previous perfect-pop music: It’s a little more wild, a little more rambunctious, and a little more free. It’s twice as little thought, but at the same time it’s twice the honesty. Now, what does that say about me? 2018 finds COIN growing into their own like never before, approaching their new music with passion, purpose, and meaning. Atwood Magazine caught up with Chase Lawrence in the midst of the band’s headline tour to discuss the ins and outs of “Growing Pains,” overthinking less, life on tour, and the band’s plans (or lack thereof) for 2018! Why don’t you calm down? Yeah, what’s the hurry now? Atwood Magazine: Firstly Chase, I just want to congratulate you and the band on the release of your second album, How Will You Know If You Never Try back in April 2017! Chase Lawrence: Thanks Mitch, that means a lot – thank you! Reflecting on it nearly a year later, what do you feel are the strongest qualities of How Will You Know? How does it, for your ears, capture who COIN was at the time? Chase: I think we really were lucky to break out of this overthinking place we were in, and I think that’s what’s so cool about, listening back to it. You can hear the layers of thought and care that went into it, but you can tell I didn’t try to overthink stuff. That was honestly a struggle for me at the time, but it’s getting easier and easier the more we do this. That was a huge win with that album. It’s funny, because today on my Spotify for some reason, I was listening to this playlist radio and (our song) “Boyfriend” came on, and I just didn’t turn it. It was really easy to listen to, and I was blown away actually. I (normally) cringe listening to my music, especially after time has passed. Not that it’s bad, you know, but like, I just would have done so many things differently! But listening to it, I was like, okay! This captures so perfectly where we were at the time, and I have no regrets honestly. I’m really proud of myself for just letting stuff exist, and not trying to squeeze it too tight, you know? It’s so hard to let go! Chase: I think what I’ve learned, and what I continue to learn is that you have to try your best and just surrender! You kind of have to hate it, before you can finish it. Now, we first met over three years ago. Go back for a second to where it all started, in bedrooms and garages in Nashville: Did you ever see COIN getting to this point? Chase: I mean, you don’t start these things… I didn’t start this to only play in a garage, but at the same time it is very surreal to walk out on a stage and see like, 1200 people that know every single word to like, every deep cut. It’s amazing. You put in the energy and the effort and you expect to see a result from it, but nothing’s promised obviously. I can’t say I knew this was going to happen – nothing’s promised to anyone – but you hope that if you work for something, you’ll get it, and for the first time, especially on this tour, it’s so cool to watch it actually unfold before my eyes. It has in the past – we’ve worked so hard and so close to things, and it’s like one thing at a time happens – a domino effect… But for the first time, we’re actually able to see a real product unfold before our eyes, and that’s been really special! I know all of you have worked so hard for this band. Chase: We kind of realized that no one is ever going to care as much as we care about this. Even if they love it as much as we do, they’re never going to put the effort that we’re going to put into it. Once we realized we have to run this literally like a startup, no matter how many resources we get, we have to always run it like we’re at the beginning stage: Never quit, never take off the gas… We’re the same band we’ve always been from the garage; we just have more resources and more family and friends now. That’s kind of the ethos we’ve kept of this band, especially over the past year when we had this revelation. We’re the same band we’ve always been from the garage; we just have more resources, family and friends now. You spoke about the sound of last year's sophomore album. Is that different from who COIN is today? Chase: Honestly, no. It’s just a more quintessential version of that band from a year ago. I think some people, when we released “Growing Pains,” expected us to be different or for us experiment more; but like, we are an extension of How Will You Know If You Never Try, almost. I dunno – we’re not at a place where we want to disappear for a year or two and make this record. We made this newer music on tour in the fall on the bus – we made it all together, and just like, recorded vocals that had people talking in the background – we just didn’t overthink anything, even more so than How Will You Know If You Never Try. We really just let whatever happened, happen. “Growing Pains” is mostly demo stuff that we recorded in a Mercedes Sprinter (van). One of the things I admire about COIN is your work ethic. You write more songs than a Republic Records songwriting camp, but rather than pump out an endless stream of material, you sit on them until they’re ready to hatch. How and when do you know if a song is “album material” or “release worthy”? Chase: That has been so true for the times past, especially for How Will You Know If You Never Try, we wrote so many songs and took the best eleven. We’ve kind of done that again for this, but we’ve narrowed it down to a two-month period where we were very inspired, and that’s kind of what this new music is: It’s what was written in this two-month period, and we’re not thinking about it. Whether we realized it or not at the time, those songs are such a sound, and are collectively an album. We were going through weird stuff as a band, and life stuff and heartbreak, and I think we’ve definitely throttled that and distilled it into something that we’ve never really done before. In times past we’ve done like a “course” of time, but this is just what we did in two months, and that’s it. At the same time, I’ve worked on some of these songs for two and a half years; they just came to fruition over that two month period. I think we just got a little mini renaissance for a minute. Now that we’re on tour we’re kind of out of it a little bit, but hopefully we’ll be able to delve back in after we get back off. Could “Growing Pains” have gone on the last album? It couldn’t have been done in less time, I don’t think, even if we’d had it before. I had to come up with certain things that I knew were necessary to the song, and necessary to the sound. It was just that perfect moment where (Butch) and I tag-teamed it, and got it done – it’s unbelievable! But it definitely needed the journey, though. I don’t think it would have been as special if it didn’t have the experiments over the course of time. Oh, what am I feeling? 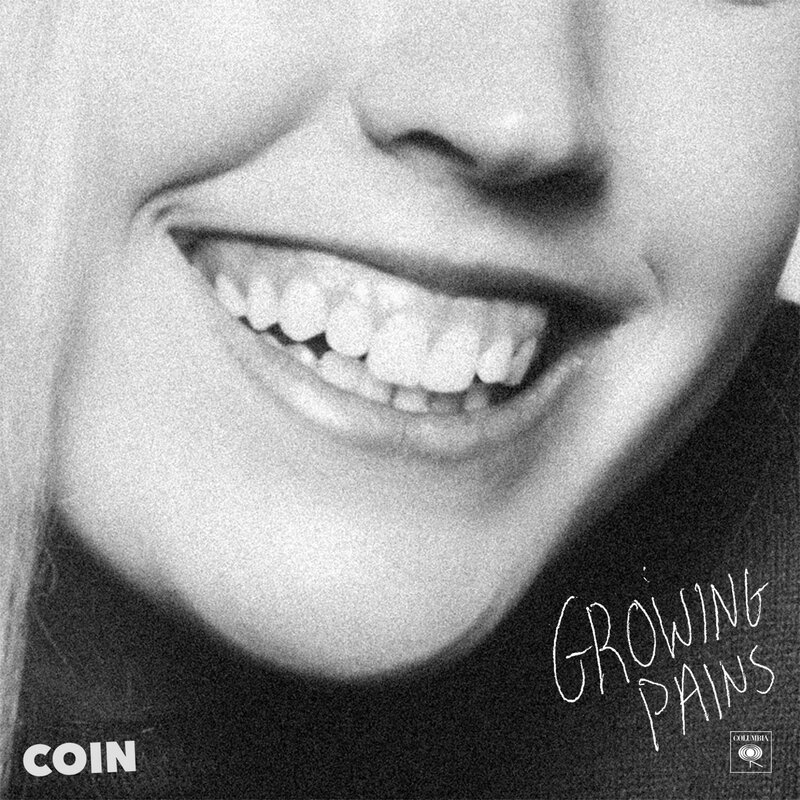 Where does “Growing Pains” fit into COIN’s story and catalog? Chase: Lyrically, it’s not as metaphorical. It’s twice as little thought, but at the same time it’s twice the honesty, if that makes sense. I don’t want to say “there’s not as much thought,” because there’s probably doubly as much thought and experiences in this; it’s just that we’re not overthinking the product that comes out of it. It’s much more sentimental and experience-based. I like this song’s dynamic range – it’s subdued at times, and explosive elsewhere. 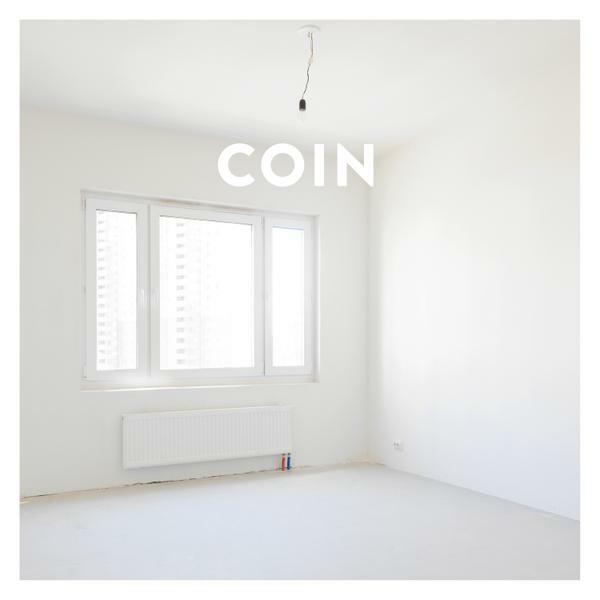 Is that new for COIN – putting that much care into a song’s ups and downs? Chase: Oh thank you! A little bit, and it’s definitely a little different production-wise. We’ve never used electronic drums to the point that it’s used in that song, like how it’s really electronic-leaning in the verses. It’s just different, the way the verses come in: It feels jarring at times, but yeah I don’t know – it is definitely different of course, but I can’t pinpoint why. It still sounds like it could have belonged on the last album, but it’s for some reason, like the next iteration of that. It’s almost like where we were before everything: We made this EP called Saturdays, and that’s the level of care, but not too much care… When we first started, I didn’t know how to care the way I care now. I think that was almost an asset, because I wouldn’t fight over a guitar chord being the wrong voicing, or a kick drum not being right. We were just playing our parts and doing what we do, and adding to the song that way. I think we learned too much, and learned how to work the language and production too well, and it backed us into a creative black hole. Now we’re at the place where each of us is doing what we do best, and not really overthinking it – of course, working together as a team and sharpening each other’s skills – but it’s really like the four of us making something together for the first time in four years. It’s really the first time we’ve done it, that way we’ve done it with this song especially, where everyone plays their parts and you can kind of uniquely hear everyone’s voice in the song. I feel like there’s also a personal element to this song. This question’s more for the tabloids, but as a touring musician, do you find it difficult to connect romantically, and to maintain a steady, fulfilling relationship? Chase: So I’ve been dating my girlfriend for seven years now, but in that seven years – and we can both attest to this – it’s tough, because I think we’ve suffered the same amount of heartbreak as anyone that would have gone through several relationships in the past seven years. Being away from each other, and having to reset after coming back, and us both wanting the same things from each other, but just being so far apart… It’s hard, but that’s what this song is about. You never actually sing the words “Growing Pains” in this song; rather, you address a series of mistakes and a seeming inability to overcome them. In fact, the lyrics to this song are some of your most personal. Have you acknowledged this? How did that come about? I especially like the phrase, I just wanna be alone sometimes, but I keep going out. There’s a strain of self-defeating prophecy, in that you sing about wanting something you actively prevent yourself from achieving. Is this real-world weariness setting in, or is it musical therapy? Chase: Maybe both? Yeah… I like that question though. That was the first line we wrote for the entire song. It hit me super hard, because – and all of us in the band feel this way – like, we need to reset and do our thing, but we just keep [going]. And our job obviously makes us do that; we’re not complaining about that. But when we’re home we need to reset, but also we need to be around people. You’ve got to figure out the balance of what’s good for your mental health. It’s probably a combo of both! We’ve nose-dived into your songwriting and musical ethic, so to bring us back to the surface, can you talk about why this song is coming out now, and how it captures the COIN band of 2018? Chase: This tour is kind of all about new beginnings and rebirth; we’re playing a lot of the rooms we played when opening for bands. Like, we opened for Neon Trees and Passion Pit at all of these venues. And it’s crazy! We thought, these were the goals – not the end-all, be-all, but “if we can be headlining these rooms and they’re full, we’re doing it!” And I think that’s what the tour is all about for us, and that’s what the song is about. It’s about growing pains, the production stepping up, and basically we’re starting back over at Phase 1: We achieved what we want to do. This is ground zero. Let’s keep moving up from here. Just as you’ve finessed your “modern sheen” pop sound, I feel like I can hear you shedding it – like COIN might start dipping a toe in the “raw” rock market. Is the polish slowly rubbing off? Chase: Yeah! And I think that has to do with what I was saying earlier: For the past three years, I’ve just delved deep into making these really elaborate demos. Our demos are notorious with our label being really good and thought-out, and then we work with a producer to deconstruct them, and then we reconstruct them. Not that it’s a bad thing – it’s been amazing in times past – but I’m at the point now, and the four of us have gotten so much better at working the tools of the trade, that we don’t to deconstruct those sounds that we’ve spent so long creating. Maybe we can add to them, but we’re at this place where it’s sloppy, kind of messy… You know, I don’t think about stuff when I’m in my bedroom! I’m not trying to fix something, not if I don’t consider it a recording. That’s what happened with “Growing Pains” – I didn’t fix any of that stuff, and that’s where that unpolished-ness came from. Obviously working with a rock producer like Butch Walker helped pushed us to that next gritty level, but I think it has a lot to do with the fact that we’re nothing about it like, “This is going to exist forever. This take has to be perfect.” There’s something mental that happens when you’re like, “Okay: This is going on the radio. This is going to exist in stone forever.” So I’m just singing with the microphone in my hands, for the first time, in front of blaring speakers. It’s not ideal for sonic purposes, but I think that for the immediate or near future, it feels really right. 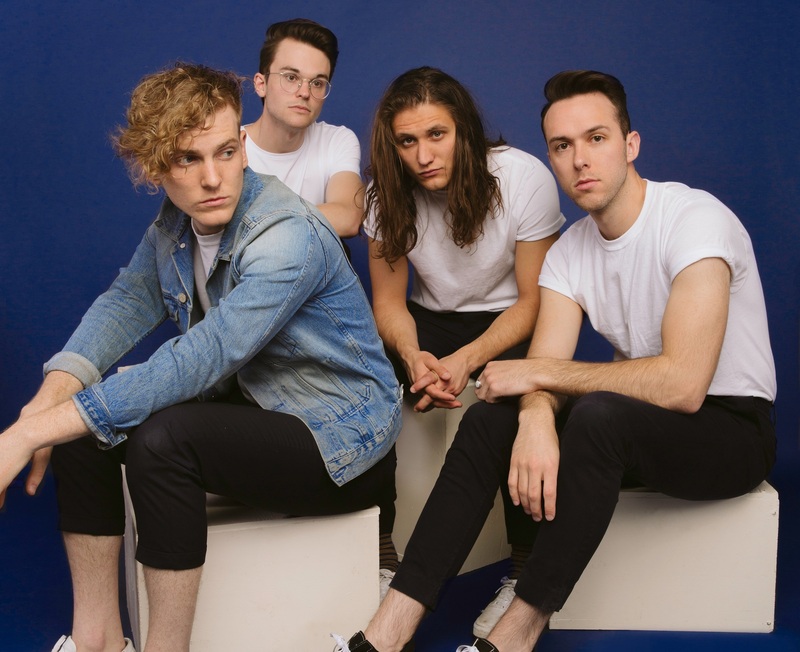 Three years ago when COIN was still in its nascence, we talked about how you “had never played a live show before this band,” and how much you were learning from that. You’ve done so much touring now, and we’ve definitely felt the effect of live performance on COIN’s music. How does the live show factor into the music you make? Chase: Especially with the new music, we’ve done our homework and figured out really works: What we like to play live, and also what the fans like to hear live. Some of the songs I don’t like playing as much as are the fan favorites, which is ironic… So we’ve done our homework and really tried to make the music that we want to make, but at the same time make something that our listeners are really excited about. It’s a give and take between making a studio album that is special, unique and dynamic, but at the same time also making music that can really translate. That’s something we’ve tried to make sure happens every step of the way – that everything can be executed live! In times past we’ve thrown a lot of paint on the canvas, and maybe not stripped back, but if something’s not doing its job in the song, we’re going to try to take it out at this point. There’s four of us on stage, and I don’t think there’s going to be any more that that, so we want to make sure we can execute it exactly like it is on the album, and make sure every part is essential to the song. It’s a give and take between making a studio album that is special, unique and dynamic, but at the same time also making music that can really translate. COIN are headlining a tour right now, playing 17 shows over the next month. What’s life like on tour with COIN – does it play out as “Growing Pains” or is it a calmer existence? Chase: It depends on the person you’re asking – if you interviewed the four of us it might be a little different. But this is our first tour with an actual bus! We’ve never had a tour bus before. This is definitely the next level for us – like, we are here for the job; we don’t have to drive anymore. It sound silly, but it honestly makes a huge difference. We’re able to experience the cities in a different way, so I think we are not probably experiencing what “Growing Pains” talks about in different ways. We’re able to actually have time to ourselves and experience new things… I’m imagining what the other guys would say and it’s just so different for all of us. I think I try to be alone so often, but it’s almost too easy to be alone now, if that makes sense. You have too much space to yourself, when you’re used to that close camaraderie – not that I miss that! – but it’s a little too easy to be on your own now. And the crew’s grown… I used to feel lonely when I was with people, and now it’s like, I kind of feel lonely sometimes! But we’ve never been happier on tour though – so I shouldn’t be complaining! You’ve referred to yourselves and your current tour as the “Great American Rock Band.” I know you’ve defined COIN as a rock band since you started, but even your record label calls you alternative pop. Is this title an attempt to control the narrative, or more of a jocular over-the-top satire? Chase: I don’t want to say satire, because I don’t want to conflate us with Weird Al or something, but in a way – yeah, we’re not self-proclaiming “great.” The only thing that is true about that statement is that we are an American band. The adjectives are just over-the-top, I think. But it’s a self-fulfilling prophecy, maybe if enough believe, it, we can become the greatest American rock band! I’m also a growing fan of your opening band, The Aces. What can you tell me about touring the country with them and your experience with their music? Chase: We definitely always try to bring a band on tour that is going to be dynamically and sonically different to our music. That was really important to us for this tour especially. It’s really important, what they’re doing: A group of four girls in a band, that shouldn’t be a novelty. So I think we’re really excited about them, leading the forefront in making good music, without it mattering what their gender is. I think we’re really happy to be bringing them along: They’re pioneers in what they’re doing, and we love being a part of it. They’re also just the best people – I’m telling you, all people from Utah are the best people; I can attest to that! What can we expect to hear from COIN this year? Chase: We’ve basically finished the album, but I think we’re going to release music as we feel like it. For the first time ever, we don’t have a “strategy.” I think we’ve always been so strategic and worried about our brand, and the way we’re represented, but really for the first time we’re able to be honest with our fans, and we have a captive audience that is listening. It’s like we’re having a conversation with them for the first time, and I think we’re just going to keep adding to the conversation as we want to. With “Growing Pains,” we finished it this year – in January! I had no idea we were going to release it, and we just released it a month later! So we’re really not overthinking any capacity of this, and I think that’s really exciting for us. We’re going to be honest, and see where it goes and figure out what comes next!